Right now you are about to enter the taper. Perhaps you’ve been at this a few months, perhaps you’ve been at this a few years. For some of you this is your first IM, for others, a long-overdue welcome back to a race that few can match. You’ve been following your schedule to the letter. You’ve been piling on the mileage, piling up the laundry, and getting a set of tan lines that will take until next year to erase. Long rides were followed by long runs, which both were preceded by long swims, all of which were followed by recovery naps that were longer than you slept for any given night during college. You ran in the snow. You rode in the rain. You ran in the heat. You ran in the cold. You went out when others stayed home. You rode the trainer when others pulled the covers over their heads. You have survived the Darwinian progression that is an Ironman summer, and now the hardest days are behind you. Like a climber in the Tour de France coming over the summit of the penultimate climb on an alpine stage, you’ve already covered so much ground…there’s just one more climb to go. You shift up, you take a drink, you zip up the jersey; the descent lies before you…and it will be a fast one. Time that used to be filled with never-ending work will now be filling with silent muscles, taking their final, well-earned rest. While this taper is something your body desperately needs, your mind cast off to the background for so very long, will start to speak to you. Your brain won’t believe it. It will use the taper to convince you that this is foolish – that there is too much that can go wrong. Finishing an Ironman is never an accident. It’s the result of dedication, focus, hard work, and belief that all the long runs in January, long rides in April, and long swims every damn weekend will be worth it. It comes from getting on the bike, day in, day out. It comes from long, solo runs. From that first long run where you wondered, “How will I ever be ready?” to the last long run where you smiled to yourself with one mile to go…knowing that you’d found the answer. It is worth it. Now that you’re at the taper, you know it will be worth it. The workload becomes less. The body winds up and prepares, and you just need to quiet your worried mind. Not easy, but you can do it. You will walk into the water with 2000 other wide-open sets of eyes. You will look upon the sea of humanity, and know that you belong. You’ll feel the chill of the water crawl into your wetsuit, and shiver like everyone else, but smile because the day you have waited for so VERY long is finally here. You will tear up in your goggles. Everyone does. The helicopters will roar overhead. The splashing will surround you. You’ll stop thinking about Ironman, because you’re now racing one. The swim will be long – it’s long for everyone, but you’ll make it. You’ll watch as the shoreline grows and grows, and soon you’ll hear the end. You’ll come up the beach and head for the wetsuit strippers. Three people will get that sucker off before you know what happening, then you’ll head for the bike. The voices, the cowbells, and the curb-to-curb chalk giving you a hero’s sendoff can’t wipe the smile off your face. You’ll settle down to your race. The crowds will spread out on the road. You’ll soon be on your bike, eating your food on your schedule, controlling your Ironman. You’ll start to feel that morning sun turn to afternoon sun. It’s warmer now. Maybe it’s hot. Maybe you’re not feeling so good now. You’ll keep riding. You’ll keep drinking. You’ll keep moving. After all, this is just a long training day with valet parking and catering, right? You’ll put on your game face, fighting the urge to feel down as you ride for what seems like hours. You reach special needs, fuel up, and head out. By now it’ll be hot. You’ll be tired. Doubts will fight for your focus. Everyone struggles here. You’ve been on that bike for a few hours, and stopping would be nice, but you won’t – not here. Not today. You’ll grind the false flats to the climb. You’ll know you’re almost there. You’ll fight for every inch of road. The crowd will come back to you here. Let their energy push you. Let them see your eyes. Smile when they cheer for you – your body will get just that little bit lighter. will grow. The chalk dust will hang in the air – you’re back, with only 26.2 miles to go. You’ll relax a little bit, knowing that even if you get a flat tire or something breaks here, you can run the damn bike into T2. You’ll roll into transition. 100 volunteers will fight for your bike. You’ll give it up and not look back. You’ll have your bag handed to you, and into the tent you’ll go. You’ll change. You’ll load up your pockets, and open the door to the last long run of your Ironman summer – the one that counts. You’ll take that first step of a thousand…and you’ll smile. You’ll know that the bike won’t let you down now – the race is down to your own two feet. The same crowd that cheered for you in the shadows of the morning will cheer for you in the brilliant sunshine of a summer Sunday. High-five people on the way out. Smile. Enjoy it. This is what you’ve worked for all year long. That first mile will feel great. So will the second. By mile 3, you probably won’t feel so good. That’s okay. You knew it couldn’t all be that easy. You’ll settle down just like you did on the bike, and get down to your pace. You’ll see the leaders coming back the other way. Some will look great – some won’t. You might feel great, you might not. No matter how you feel, don’t panic – this is the part of the day where whatever you’re feeling, you can be sure it won’t last. You’ll keep moving. You’ll keep drinking. You’ll keep eating. Maybe you’ll be right on plan – maybe you won’t. If you’re ahead of schedule, don’t worry – believe. If you’re behind, don’t panic – roll with it. Everyone comes up with a brilliant race plan for Ironman, and then everyone has to deal with the reality that planning for something like Ironman is like trying to land a man on the moon. By remote control. Blindfolded. How you react to the changes in your plan will dictate your day. Don’t waste energy worrying about things – just do what you have to when you have to, and keep moving. Keep eating. Keep drinking. Just don’t sit down – don’t EVER sit down. You’ll make it to the halfway point. You’ll load up on special needs. Some of what you packed will look good, some won’t. Eat what looks good, toss the rest. Keep moving. Start looking for people you know. Cheer for people you don’t. You’re headed in – they’re not. They want to be where you are, just like you wanted to be when you saw all those fast people headed into town. Share some energy – you’ll get it right back. Walk if you have to. The miles will drag on. The brilliant sunshine will yawn. You’ll be coming up to those aid stations fully alive with people, music, and chicken soup. TAKE THE SOUP. Keep moving. You’ll soon only have a few miles to go. You’ll start to believe that you’re going to make it. You’ll start to imagine how good it’s going to feel when you get there. Let those feelings drive you on. When your legs just don’t want to move anymore, think about what it’s going to be like when someone catches you…and puts a medal over your head… all you have to do is get there. You’ll start to hear the people in town. People you can’t see in the twilight will cheer for you. They’ll call out your name. Smile and thank them. They were there when you left on the bike, and when you came back, and when you left on the run, and now when you’ve come back. You’ll enter town. You’ll start to realize that the day is almost over. You’ll be exhausted, wiped out, barely able to run a 10-minute mile (if you’re lucky), but you’ll ask yourself, “Where did the whole day go?” You’ll be standing on the edge of two feelings – the desire to finally stop, and the desire to take these last moments and make them last as long as possible. You’ll hit mile 25. 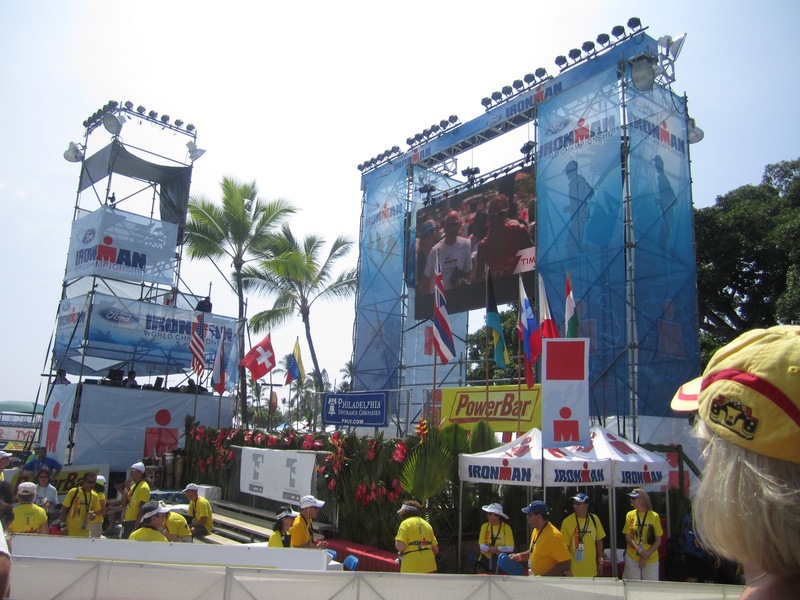 Your Ironman will have 1.2 miles – just 2KM left in it. You’ll run. You’ll find your legs. You’ll fly. You won’t know how, but you will run. The lights will grow brighter, brighter, and brighter. Soon you’ll be able to hear the music again. This time, it’ll be for keeps. Soon they’ll see you. Soon, everyone will see you. You’ll run towards the lights, between the fences, and into the night sun made just for you. The moment will be yours – for one moment, the entire world will be looking at you and only you. You’ll break the tape at the finish line, 140.6 miles after starting your journey. The flash will go off. You’ll stop. You’ll finally stop. Your legs will wobble their last, and suddenly…be capable of nothing more. It will suddenly hit you.